In New York City, we are spoiled in our choice of world class food. With all the choice that surrounds us, pizza remains the one thing every New York foodie is an authority on. As a kid growing up in Flatbush, the Brooklyn of the early 70’s spoke to me through my nose and my taste buds. Even if you were just walking down the marble stairs of your apartment building or passing open windows down Foster Avenue, you were ambushed by rich aromas of the foods of every nation. Pizzerias were everywhere on Flatbush Avenue and throughout our neighborhood. Antonio’s Pizza on Flatbush Avenue since the 50’s. Pizza is in Brooklyn’s DNA. As a kid, the waft of cheeses and zesty Italian sauce married in the oven to create its own advertising coming out of three pizzerias within our walking distance of our apartment building, twenty cents a slice. Joe and Pat’s owners, Gennaro, left, and Joe Pappalardo. Growing up on Staten Island, the spoiling continued with thin crust legends Joe & Pats one block away. Their sauce is light, slightly sweet and the quality of their cheeses is apparent in every bite. The Roadhouse still has a clam pie worth traveling for and the bar pies at Lee’s Tavern pack them in today. Nunzio’s on Hylan Blvd is another south shore gem. I went to Brooklyn College and would stop at DiFara on the way home or perhaps Tontonno’s in Coney Island. L & B Spumoni Gardens is still a great place to enjoy pizza and frozen treats under the stars on a warm Brooklyn evening. 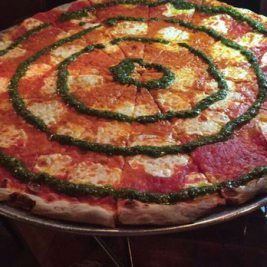 Spending time in Bay Ridge exposed me to a whole new list of great Brooklyn pizza joints. Everyone swears by the slices at Pizza Wagon on Fifth Avenue near 86th Street. Gino’s is a superb Italian restaurant altogether with a pizza counter up front that is great on the go. Nino’s on 3rd Ave near 92ns Street has one of the best Grandma slices I’ve ever tasted. Elegante is the least fancy of the bunch, but features a Sicilian slice that rocks. Leo’s Casa Calamari has classic Brooklyn slices and other goodies (like, um, calamari). I moved to the East Village of Manhattan and lived through the Ray’s pizza wars of the late 80’s and early 90’s. Big, doughy slices with bland cheese and meh sauce. Not my cup of tea. Stromboli Pizza on St. Mark’s and First was and is more my style. Many of the pizzerias that appear on local and national lists the best pizza anywhere are only short walks away- the coal oven thin crust of Arturo’s, the funky Cajun/Italian fusion toppings and stellar sauces of Two Boots, the old school retro legends of Staten Island pizza that have opened downtown outposts, Denino’s and Rubirosa (child of Joe & Pat’s family, soon to open their own outpost on First Avenue where Lanza’s was for year’s). I can get a square at Prince Street Pizza, if the line isn’t around the block or the under-rated Champion Pizza that won’t have those lines and the fairly priced slices are delicious. Tourist favorite Lombardi’s (America’s first pizzeria) will surely have a line, while Pomodoro won’t have a line and their tangy buffalo chicken pizza will make you swoon. Joe’s is just a stroll over to Carmine Street away for a classic NYC plain slice and “no fancy pants pies” attitude or go around the corner and sit down like a gentleman at John’s of Bleecker Street for a crumbled sausage pie (no slices). Of the new fangled pizza places, the Paul’s Boutique at Speedy Romeo with Katz’s pastrami, dijon bèchamel, smoked red kraut, fontina, 1000 island dressing and an everything bagel crust is fusion at it’s best. Motorino is definitely fancy, but in the best possible way with imaginative combinations and fresh ingredients. Keste is newish, but their traditional ingredients and inventive white and red sauces feels old school. You wanted to know where real New Yorkers eat their pizza, now you know!